Build and use the best tanks in the world! 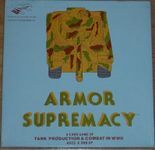 This card game is based on World War II tanks, which became bigger, better armored, and more powerful as the years passed. Here two to four players "design" and "manufacture" various tanks, then bring them into "combat" with the enemy. You can work with different types of hulls, turrets, guns, mountings, special armor plate, and even anti-tank guns. Existing designs can be modified and improved, but every new tank must "fight" all other tanks to gain Armor Supremacy! The boxed game comes complete with 108 playing cards and rules of play.